Online donations go to Vision Earth Society's PayPal account. Vision Earth Society Incorporated is registered as a 501(c)(3) non-profit organization. 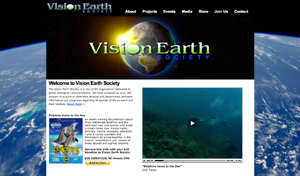 Contributions to Vision Earth Society are tax-deductible to the extent permitted by law. Donations of $250 or more will receive an email receipt for U.S. income tax 501(c)(3) charity deduction purposes.